I worked at a boarding house for a year just after I graduated from University and just before I started this blog. Between all the staff members we had a gift giving policy that you were paired up and had to give a gift to that person for their birthday. I had never been hooked on cross stitch but decided to give this one a decent go. Being slightly Disney obsessed I loved the theme. I organised the supplies and found a frame to hold the cross stitch and off I went. I was truly hooked! It took a couple of months but I finished that cross stitch and since then have never looked back. As soon as I had finished that project I was rushing off to buy the threads and find the fabric for my next one. I just wish now that I had more time for every project that walks in the door. Unfortunately the Belle Cross Stitch is still sitting tucked up neatly in my finishing box waiting to be finished. It’s an awkward size and I really don’t know what I want to finish it as. Maybe someday the inspiration will strike and I will have no choice. It’s just too big for an ornament and not special enough (or goes with my decorations) for me to want to put it on my wall. So it just sits there in the box and waits. I wish I had more time at the moment but my cross stitch is getting neglected in favour of slightly more useful projects like work clothes! Interesting story. It was funny how you were hooked once you had the right project! Nice to read about how your cross stitching began. What a pretty first project! Hope you can figure out how to finish it. I like the idea at the boarding house with being paired up with someone like that for birthday gifts :) A sense of community I think! 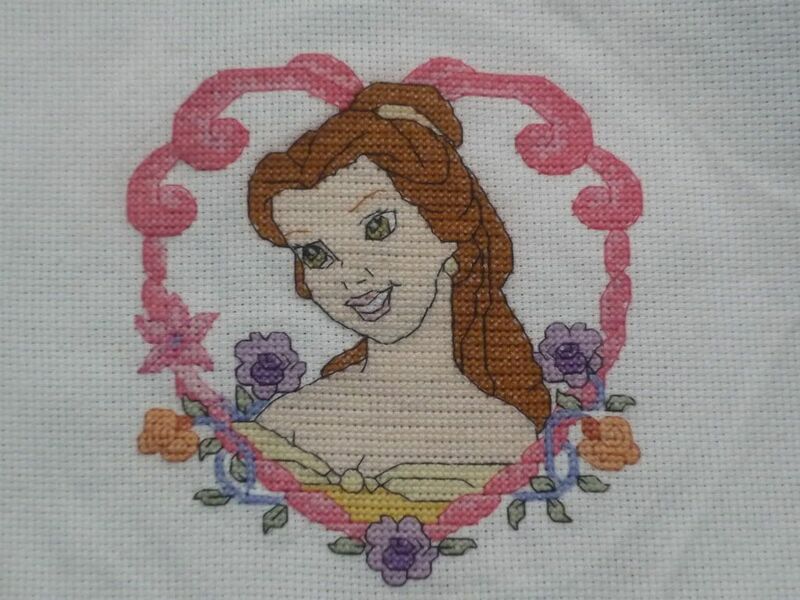 What a cute project you did to get hooked on cross stitching! How great that the gift sparked a life long love of stitching! I scrapbook my smalls so they are presented nicely in a book. You can get some great Disney papers and start a new hobby!